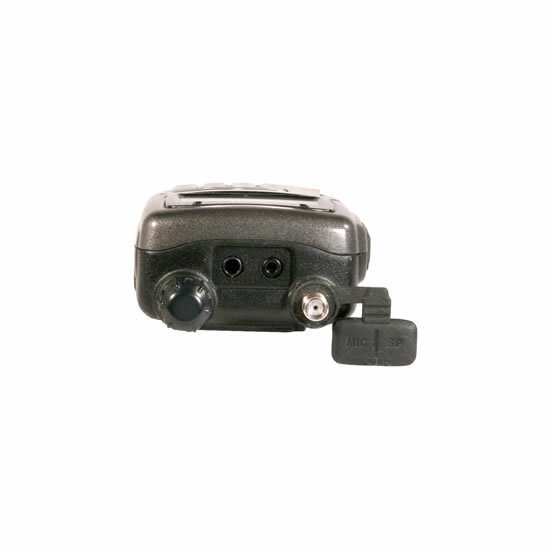 The commercial grade IC-T90A transceiver offers a wideband AM, FM, and WFM scanning receiver. Not only you can hear your favorite TV programs with the pre-programmed TV memories, but also you can listen to shortwave, AM and FM broadcast radio stations with good sound quality. Fire, aircraft and various amateur bands also can be tuned. you can pick and choose the desired channel for scanning from the 500 memories. Enjoy a full 5 watts from the supplied 1300mAh Lithium-Ion battery pack, BP-217. Along with the energy conserving settings, the BP-217 provides up to 5 to 6 hours* of operating time and greatly reduces both the size and weight needed to get full output power. Just recharge and go! This compact radio is comfortable in the smallest of hands, and offers full radio control for large fingers. The aluminum die-cast case and chassis is designed for the most rugged environments with splash resistance equivalent to JIS 4 specifications. *2 See back for actual dimensions. 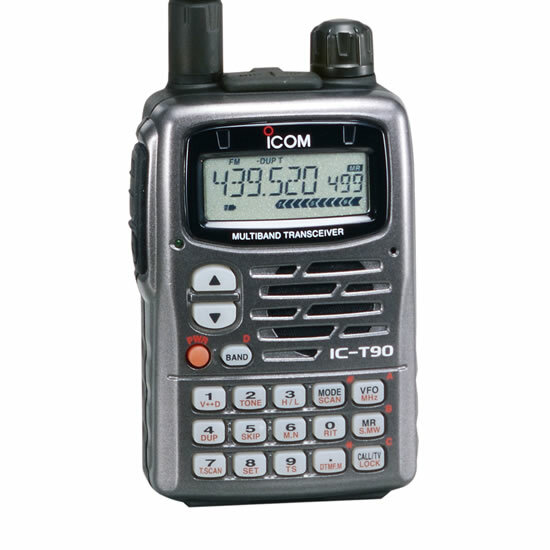 A standard feature of the IC-T90A is both DTCS and CTCSS encode and decode capability. 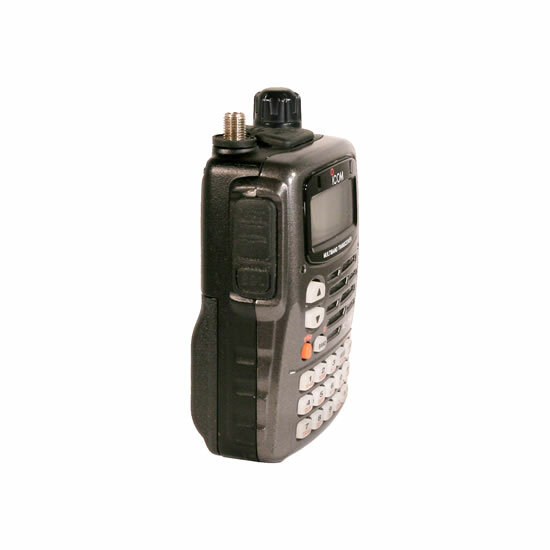 Choose from either 104 DTCS or 50 CTCSS codes for receive and transmit, individually. 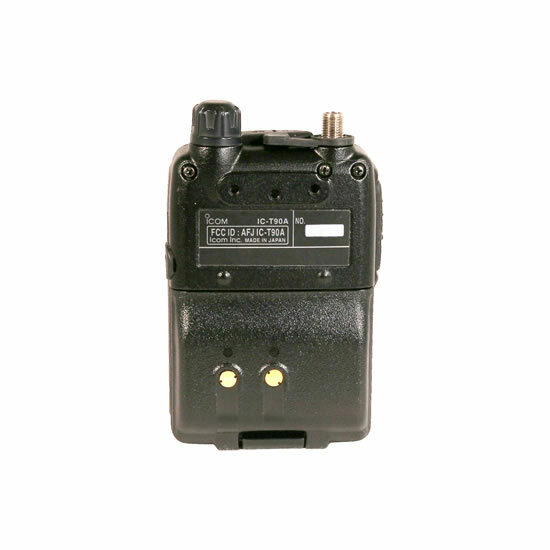 In addition, a pocket beep function gives you an audio alert when a matched tone signal is received__a great feature for quiet, group operations. Simple, one-handed operation is the most valuable feature of the IC-T90A. The backlit ten-key pad allows you to enter frequency, memory number and set various other features. The tuning knob can be customized for either channel selection, or volume control.